Adenosine is a nucleoside. The compound is made up of adenine and ribose. Adenosine is a part of the energy-rich compounds adenosine triphosphate (ATP) and adenosine diphosphate (ADP). It also serves as a signal molecule. Adenosine blocks the release of excitatory neurotransmitters (amongst others dopamine, acetylcholine and noradrenaline) and causes dilation of blood vessels which leads to lower blood pressure. Furthermore, adenosine lowers the heart rate and prolongs the conduction time at the atrioventricular (AV) node by activating G protein-modulated potassium channels through A1 adenosine receptors. 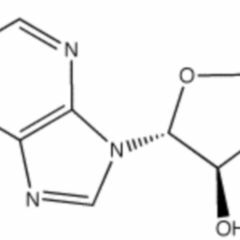 Moreover, adenosine activates the lateral preoptic nucleus in the hypothalamus which is sleep-inducing. The xanthines caffeine, theobromine and theophylline, as well as istradefylline act as antagonists of various adenosine receptors. For this reason, theophylline is given as an antidote. An indication for administering adenosine is an atrioventricular nodal reentry tachycardia (AVNRT). Adenosine blocks conduction at the atrioventricular node. The physiological half-life of adenosine is in the range of a few seconds. Adenosine must not be administered in case of bronchospasm, bronchial asthma, or patients with COPD. Another contraindication is the Wolff-Parkinson-White syndrome (WPW). The blockage of conduction at the atrioventricular node can cause ventricular tachycardia.